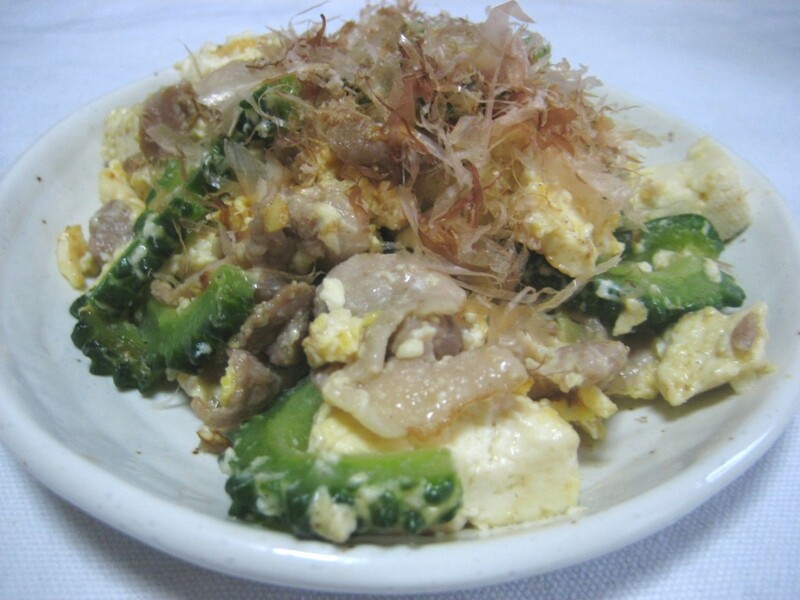 “Gohya Champloo” is a food originated in Okinawa where the most south prefecture of Japan. 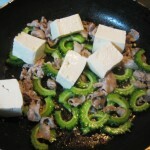 It is the stir fry of bitter melon, pork, tofu and egg. 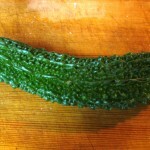 However the bitter melon is called “Nigauri” in Japanese, in Okinawa it is called “Gohya” as a dialect. 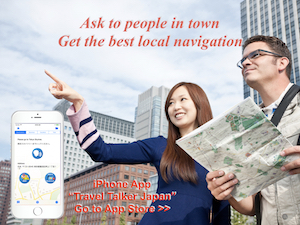 Now “Gohya Champloo” is very popular nation wide and we call it as “Gohya” even in Tokyo. “Champloo” seems to mean “stir fry” in Okinawa, and there are some other champloo foods. It is said that the origin of “champloo” is the word “champur” in Indonesia / Malay. Because Okinawa is the most south part of Japan, I guess they had many cultural exchange with southeast Asian countries since old time. 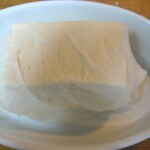 2) Wrap tofu with cooking paper, then about 1 and a half min. in microwave. (It reduces moisture.) Cut the pork as a bite size. Chop the ginger. 3) Pour sesame oil (or cooking oil) in a fry pan and heat it with ginger on low heat. 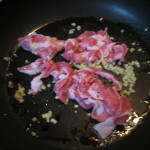 4) Put the pork, some sea salt and pepper in a fry pan and heat them on middle heat until pork turn to white. 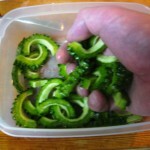 5) Add the bitter melon and fry together. 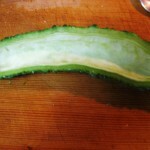 When the bitter melon is wilted, add tofu and Chinese soup stock. Stir fry everything like smashing tofu. 6) Pour broken egg and mix them. When half of egg is baked, turn off heat. 7) Serve it with some dried bonito flake (Katsuobushi). 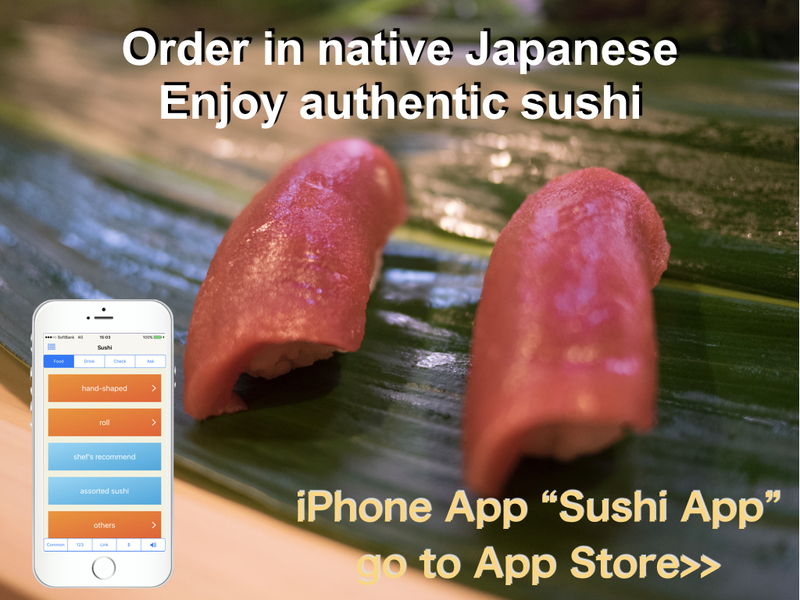 In Okinawa, it seems to be cooked with tofu called “shima tofu.” It seems to be hard one. I’m living in Tokyo, so I used Momen Tofu which is harder then Kinukoshi Tofu for this dish. As for Chinese soup stock, I used pork soup stock however chicken soup stock (called as “Torigara soup no moto” etc.) is popular. I think chicken soup stock is also good. 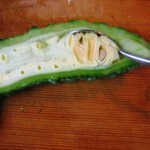 It is said that the bitter melon is good for health. And Okinawa is know as the prefecture of longevity. I believe those foods have very close relation with the fact of longevity.